Do Weddings Exist Today Just So We Can Document Them On Social Media? These days, it’s practically part of the liturgy—the moment before the wedding ceremony when the celebrant asks assembled guests to put away cameras and phones. Every time I witness the sliding of smartphones and cameras back into pockets and wedding-only beaded clutch bags, I can’t help but think the whole situation has become a chicken-and-egg question: Do we document weddings because they’re important, or do weddings exist to be documented? A recent survey in America found that for a majority of brides-to-be, the sharing of photos begins at the pre-wedding dress fitting, nearly half of those surveyed also said they would happily Skype their weddings to family and friends who didn’t want to travel for the big day, who would prefer to ”take part” from their living rooms. And what would be the point of Facebook without wedding photos—posted live for friends to delight in and for ancient school frenemies to rip to pieces. But for all that I have complained about the number of times I’ve been assigned by friends to the table with the single cousins to keep the mood up with witty banter, I still appreciate weddings for the most part—it’s always lovely to be invited. But that enjoyment wanes when proceedings veer into performance—when the photographer or videographer’s artistic vision directs proceedings. I have been made to trek through a muddy field in lovely shoes to lark about in group photos. On another occasion, I and other guests were kept waiting for 20 minutes in the cold while the bride and groom posed for photos signing the wedding certificate—even though the wedding ceremony had been performed by one of their friends and the certificate wasn’t legal (they had tied the knot in a registry office two weeks earlier). It’s tempting to say this is an example of the shift toward the commodification of a once-meaningful milestone, but then weddings have always been about commodification. For older generations, this meant fathers finding husbands to pass on the ownership of daughters. For our generation, it’s increasingly the case that the commodity is the wedding itself. But if there’s ever an occasion calling to be over-shared, your wedding might as well be it. After all, if you choose to spend a small fortune celebrating that you and the person you love most in the world have decided to spend the rest of your lives together (or perhaps, to gamble on the 50 percent chance that you’ll spend the rest of your lives together), you might as well plug every single, expensive, second. 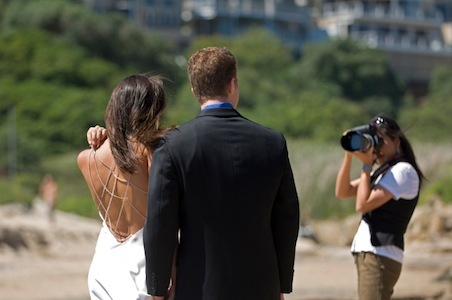 Does documenting the heck out of a wedding devalue its importance? Perhaps, but then I’m not sure that weddings have very much else to support their existence—they’re no longer the hinge between childhood and adulthood, they’re no longer a prerequisite for starting a family, cohabiting, they do not represent financial independence from parents. Weddings may be the beginning of a marriage, but they don’t really reflect the reality of it—a project relying on love to overcome moments that don’t look pretty even behind an Instagram filter. There’s a strong argument in favor of the non-social wedding then—when we put our phones away, we have the opportunity to be truly present. But then again, you might then be tempted to consider whether a wedding actually makes any sense in the modern era (many aspects don’t). By distracting us from analyzing the legitimacy of the wedding as ritual, social media will help us to preserve weddings as a tradition for the generation to come. A generation that will regard the digital relics of our love affairs with fond sentimentality, mixed with confusion about why women wore stilettos to leap about in muddy fields. Jean is a writer for The Daily Life. You can follow her on Twitter here.